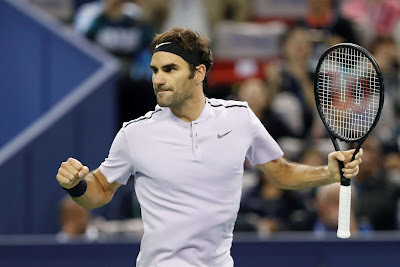 Roger Federer will face longtime rival Rafael Nadal for the fourth time this season after coming from a set down to defeat Juan Martin del Potro, 3-6, 6-3, 6-3 at the Shanghai Rolex Masters. The 2014 champion advances to his third final at the ATP World Tour Masters 1000 event. Federer’s win set a crucial showdown with Nadal in the battle for year-end World No. 1. Should Nadal win on Sunday he will stretch his lead over Federer in the ATP Race To London to 2,760 points and effectively put the issue beyond doubt. However, should Federer win his fifth consecutive match over Nadal, he would pull to within 1,960 points. That’s still a lot of ground to make up to finish atop the year-end standings for the first time since 2009, but within the realm of possibility if Federer finishes the year as strongly as he started it. "It's nice at this late stage of the career that we still have these matches going on," Federer said. "There is only going to be a few chances for either player, and sometimes it's just who blinks at the wrong time." After failing to capitalise on four consecutive break points while down a set and up 3-2 in the second set, it appeared that Federer might be denied a meeting with World No. 1 Nadal for the second time in as many months by the Argentine, who defeated him in the quarter-finals at the US Open. But when del Potro missed a forehand wide on the fifth consecutive break point he faced, the 29 year old gave the Swiss all the momentum he needed to turn the match around. "Clearly getting the break and then holding, it's always key in tennis," Federer said. "I'm happy I was able to do it, especially with all the twists and turns and, blink at the wrong time, he might hold the game and then you don't know what's going to happen next." The 36 year old did not face a break point in the final two sets, and broke twice in the decider to advance in one hour and 58 minutes. It was unclear just how fit del Potro would be for the match after he fell on his surgically-repaired left wrist in the third set of his quarter-final victory against Viktor Troicki on Friday. His communications manager, Jorge Viale, tweeted that the 2013 Shanghai finalist suffered a contusion, and was in a splint Friday evening. But you would not have known it by watching the right-hander compete against the World No. 2. Early on, he answered virtually every aggressive shot by Federer with an even bigger forehand of his own, and even stepped into a number of two-handed backhands down the line to gain control of points. The Swiss consistently attacked his opponent's weaker backhand before changing directions to finish points to del Potro's forehand, but the Argentine's rocket of a forehand proved too tough to handle more often than not. On Federer's first break point in the sixth game of the second set, he chose to approach to del Potro's forehand, which came back like a laser from meters behind the baseline, a passing shot that forced a backhand volley error. But once Federer finally broke through in the 19-point game in the second set, del Potro appeared frustrated, especially with the pro-Federer crowd in Shanghai, which the chair umpire had to ask to quiet down. "He took the confidence after that game. He broke me and he started to play more aggressive. He served much better after that game. I think he beat me in a good way," del Potro said. Federer began to use his slice to throw off del Potro's rhythm and extract more errors, and using his openings to be more aggressive himself. The strategy worked, and the 26-time Masters 1000 winner won 37 per cent of points on his opponent's serve in the final set, consistently threatening to break. Del Potro admitted he only decided when warming up for the match that he would play, having been advised it would not risk his wrist. "I have been playing good tennis this week, but I felt good during the warm-up before the match, and I decided to play, because against Roger always is an honour to play," said del Potro. "The court was really fast, so maybe that would help my game. "I think I did well, but Roger played much better than me some moments of the match, and he took the chances." Federer will meet Nadal for the third time in a final in 2017, after winning the titles against him in Melbourne and Miami. The Swiss also beat his rival in their other meeting, which came in the Round of 16 at Indian Wells, and will look to close a 14-23 deficit in the pair’s ATP Head to Head rivalry. The Spaniard carries a 16-match winning streak into the final, and will look to extend his tour lead to seven titles this season. Federer will attempt to tie Nadal by claiming his sixth trophy of the year. Del Potro thinks Nadal is the only player capable of beating Federer in this form on the fast Shanghai courts. "I think the court helps Federer's game a lot, and he always is in good shape," said del Potro. "He looks like an unbelievable athlete. I think on this court not many players can beat him. Maybe Rafa tomorrow, but if not, he's the only one who can play an excellent tennis on this faster surface. "Rafa is playing so good, but I think Roger could win if he feels the ball really, really well. Because the court is so fast, and for the game of Roger it is much better than Rafa's game, but Rafa is a fighter and he never gives up. It will be interesting to watch."